Best. Salad. Ever. Ever. Ever. I’ve got an awesome salad recipe for you that is so versatile, and so incredibly delicious, that it will now be your go-to salad recipe. For serious, everyone I’ve ever made this salad for loves it and asks me for the recipe. It’s really all about the dressing – the mix-ins can be changed up with whatever you’ve got in your fridge/pantry. 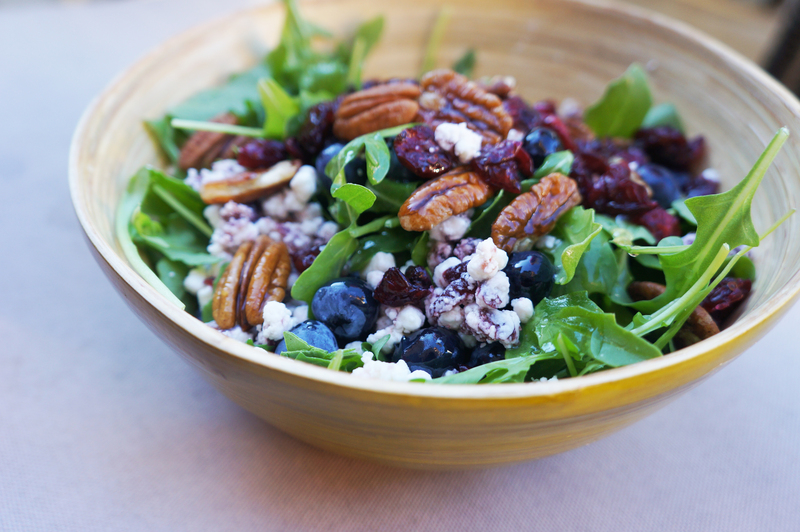 Toss the lettuce, blueberries, dried cranberries, sunflower seeds, walnut pieces, feta cheese, and goat cheese in a large bowl. Pour the vinegar, syrup, and grapeseed oil over the salad one at a time; toss until evenly coated. You can also prepare the salad dressing separately and save any extra for later. Season with salt. Serve with anything and everything. Enjoy!